Despite their busy schedule, the Navy's Seabees have managed to devote time to the community. 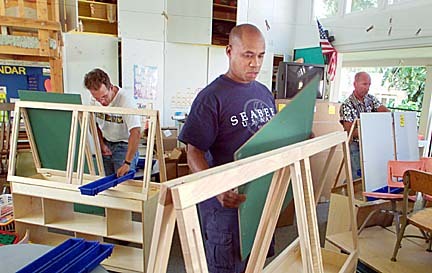 Robert Bray, above foreground, Guy Altemus, left, and John McCarthy assembled easels Friday in a classroom at the Central Union Church preschool. It's been nearly 11 months since the first group of reservists and National Guard personnel were activated following the terrorist attacks on the Pentagon and the World Trade Center. More than 82,000 still remain in uniform, including 50 Navy Seabees from Hawaii who were lucky that they didn't have to leave the islands. Petty Officer Anthony Abellira, 38, said: "We were ready to go when the call came (last November). But all in all, it's pretty nice to serve our country while staying at home." Abellira, who in the civilian world works for the city Road and Refuse Division in Wahiawa, is one of 173 Seabees assigned to Construction Battalion, Maintenance Unit 303. The unit is made up of Navy reservists from Hawaii and California. Following their November activation, the Seabees were assigned to Pearl Harbor, where they have filled security positions while doing maintenance and other military construction work. Timothy Zavala, a Navy reservist, helped Sharon Mossing, a volunteer, move books into what will become the new library at the preschool. Petty Officer Robert Bray, 39, admitted: "It was pretty scary at first since I didn't know exactly where I was going and what I was going to do. "But I am happy to serve my country," added Bray, who left a job as a diesel mechanic with the company charged with cleaning up Kahoolawe. Chief Petty Officer Tim Van Cleave, who was supposed to take a new teaching job at Keaau High School before his unit was activated, said the change has been "tolerable." "I can go home every other weekend to the Big Island," said Van Cleave, 40, who has served in the Navy for 22 years. "It's harder for others in our unit whose homes and families are on the mainland, so I can't really complain." Petty Officer Nathan Kapule, a 21-year Navy veteran, acknowledged that he suffered a financial setback since he earned more as a fire captain at the Kaimuki station. "It was rough," said Kapule, pointing out that his wife, who is a nurse, had to cut back her hours to help care for the couple's four children, which includes a set of triplets. "Both of our work schedules overlapped, so she had to stay home to watch them." Despite having to maintain an active work schedule, the Seabees have managed to devote some of their days off to community work. Kapule serves on the board of Central Union Preschool and Kindergarten, where his children have attended. When the school needed help to improve the 80-year-old facility at Punahou and South Beretania streets, unit members readily volunteered. "We were frankly blown away by their offer," said Kathy Ingoglia, the school's business manager. "We have 25 ladies as preschool teachers and we can do a lot, but there are things we can't do. Nathan and his unit came in and saved our life." Nearly a dozen members of Van Cleave's section went to Central Union on Friday to move furniture and books to a new library, build new furniture, paint a renovated lounge and kitchen and do other minor construction work. Kapule said his unit also helped install a sprinkler system at Moanalua Elementary School in May. "That was a pretty big job," he said. But Kapule, like other members of his unit, is anxious to return to civilian life. With a bachelor's degree in nutrition and a master's degree in exercise science from the University of Hawaii, Kapule, 45, had worked for the Honolulu Fire Department developing its physical fitness program. That ended with the Sept. 11 tragedy, and he wants to finish that job. "My job was to help firefighters maintain a healthy lifestyle," said Kapule, who has been with HFD for 21 years. He also wants to develop a similar program for Central Union's preschool and elementary children. "That's the best time to get them and their parents involved," he said. 'Maybe to get them to make their own personal assessment." Van Cleave also is anxious to return to the classroom and teach social studies and help coach Keaau's football team. "I never expected to be activated," said Van Cleave, referring to the first time he was pressed into federal service during the Gulf War in 1991. "But when I saw the Massachusetts National Guard being called up this time, I knew this was going to be big. But then that's the way the military is going now, depending more and more on the reserves." Besides Van Cleave, this is the second activation for other members of his unit, including Kapule and Petty Officer John McCarthy, who in his civilian job manages power distribution for the city of Anaheim. All are Gulf War veterans. As of last Wednesday, the total number of citizen soldiers on active duty include 35,605 in the Army National Guard and Army Reserve; 6,996 in the Naval Reserve; 35,075 in the Air National Guard and Air Force Reserve; 3,858 in the Marine Corps Reserve; and 1,298 in the Coast Guard Reserve.